My attention has been drawn to this video—entitled, rather melodramatically, The Most Terrifying Video You'll Ever See—which you should watch before I debunk his argument. Now, there is an immediate problem with his logic that should be obvious. Spotted it? Because apparently none of Ron's friends can. Yes, it is in A:True. Why? It is simple. Whilst Ron assumes that A:False will lead to "global depression", he assumes that A:True does not; he has inserted a smiley face instead. However, by Ron's logic, if A:False leads to global depression, A:True must also do so. 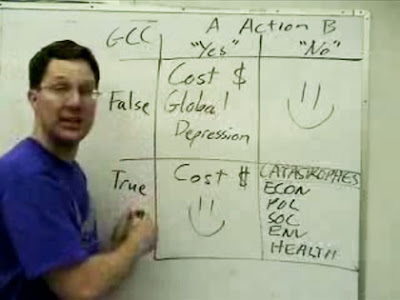 By Ron's definition, it may be true that global depression is better than the alternative, as represented in B:True, but it does not mean that it doesn't happen. This rather changes the grid and, simultaneously, utterly undermines Ron's logical argument; what this means is that Column A is now a lose:lose situation, whether GCC is happening or not. Thus, by Ron's logical extrapolation, the best thing to do is to choose Column B and do nothing because, in that way, there is a 50:50 chance that we will be alright. If, however, we choose Column A, there is a 100% chance that we will definitely lose out. I could, of course, also argue about the extremity of his positions; the likelihood of a 20 foot water rise—yes, he quotes Gore and, yes, the likelihood of that happening in the next 100 years (let alone the next few decades) is 0—or increased Katrina-style hurricanes, etc. 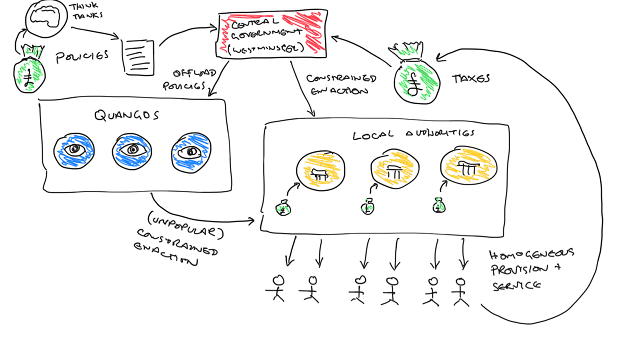 However, all that Ron asked is that we debunk the logical argument which I have done: quod erat demonstrandum. As Ron says, spread the word. I'd like to know if he gets back to you over this, should he ever hear of your rebuttal. Essentially, Ron, clearly not a stupid man, is a climate change believer. Now that he has demonstarted to his own satisfaction that, logically, there is no choice but to confront it and reduce CO2 emissions Gore-style, he is clearly also a very happy man. But I doubt that any argument, however logical, will shift his default position. He wants to believe in man-made climate change. I strongly suspect you could stick a small tactical nuclear weapon up his arse and he still wouldn't change his mind. It's why you can never win the argument with the likes of Ron These people don't do reasoning. They do belief. Isn’t there another, similarly fundamental, flaw - that, by abandoning any reference to the real possibilities that underlie his simplistic summary, he renders the entire exercise invalid? After all, we cannot absolutely rule out the possibility that evolution or human intervention generates a virus so deadly that it wipes out the entire human race. By his logic, since this possibility – however unlikely – exists, we should take all possible steps to eliminate that risk whatever the associated cost. Using his logic, we should all be permanently confined to our own individual isolation wards. ad627 - quite. This is possibly the stupidest argument I have ever seen, on practically every level. Can he PROVE there isn't about to be an alien invasion and we should spend 10% of global GDP on giant space lasers? I can point to people who think this will happen. Hey, what's a catastrophic global depression between friends? This is essentially a restating of the precautionary principle much beloved of the government. Aside of column A being lose-lose, there is a further problem, which is that if CO2 emissions are not the driving force behind climate change, then costly action to reduce C02 will fail to put us into column A anyway. This is the problem. It's not enough to do something, to guarantee column A. You have to do the right thing. Given how politicized the whole global warming business is, I can't see that happening until disaster really is staring us in the face, if that actually ever happens. Ron needs to study boolean algebra and the fact that you cannot reverse logic. He is talking GCC and you are talking AGW, which, as we know, are two separate things which can have overlap and the extent of that is the debate. GCC = doom? Not so sure. GCC = reality. Sudden GCC with no human reaction = doom, yes. Action has no proven effect on GCC. Action on AGW, maybe. Action = global depression, if the action is fascist, taxation, backwardness, stone-age, i.e. precisely the types of action the environazi want us to do. Fact is, if we prevent global depression, we will be in a better state to deal with GCC. 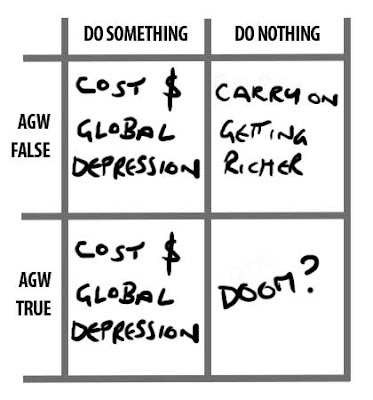 If you notice also, Ron has put GCC, not AGW, but you have. Just chiming in to agree with sacerdote. Ron assumes that taking action is always good. Suppose for one instant that some lunatic decides the best action to take is to begin a programme of forcible euthanasia of all those over 50 years old, in order to bring down the world's population and reduce our collective carbon footprint. By Ron's very simplistic calculations, this would be a winner. Any massive action undertaken in an effort to tackle GCC (Or AGW) will only have my backing if performed by Ra's al Ghul. This argument starts from the wrong place. Until you have proved that 'doing something' will have the desired effect then its all academic. Its a false premise for me. Is global warming man made or natural? One thing I think that is not in dispute is our consumption of nonrenewable resources. Our resources are precious and we need to conserve whenever possible. We can conserve our natural resources by using solar power. Two ways are on the horizon that will make solar power affordable to every household. One is Nanosolar and the other is the Citizenre plan. I follow both in my blog at www.solarjoules.com.